Henri Gaudier, he only son and eldest of the three children of Germain Gaudier (1864–1934) and Marie-Alexandrine Bourgoin (1865–1954), was born in St Jean de Braye, France in 1891. His father was a carpenter. In 1907 Gaudier's academic and linguistic ability won him a two-year state scholarship for study abroad, which he spent at the Merchant Venturers' Technical College in Bristol. He also spent time in Cardiff, Nuremberg and Munich. Gaudier moved to Paris in September 1909, where he worked briefly for a publisher, a lens manufacturer, and a textile firm while studying in the libraries and museums of the city. According to his biographer, Evelyn Silber: "He (Gaudier) drew people, animals, and the urban scene, laying the basis of his rapid and immensely versatile draughtsmanship. 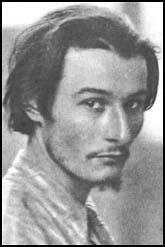 In May 1910 he met Sophie Suzanne Brzeska (1871–1925), a Polish woman who became his lifelong companion in a volatile but probably platonic relationship. They moved to London in January 1911, adopting the surname Gaudier-Brzeska and the identity of a Franco-Polish brother and sister to lend respectability to their cohabitation." 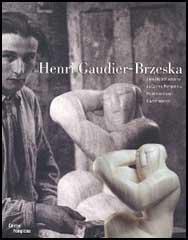 In 1912 Gaudier-Brzeska began to establish himself as a sculptor, first in clay and then in stone. Influenced by the work of Auguste Rodin, Jacob Epstein and non-European art in 1913 he produced The Dancer, a portrait of the artist, Nina Hamnett and Redstone Dancer. He also modelled portraits of friends, including Frank Harris, Alfred Wolmark and Horace Brodzky. He became a founder member of the London Group and the following year signed the Vorticist Manifesto. However, he sold few sculptures and received only a handful of small private commissions. 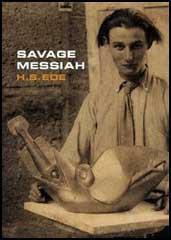 Gaudier-Brzeska asked Enid Bagnold to pose for him. She later recalled: "He didn't want to know what people were like. He rushed at them, held them, poured his thoughts over them, and when in response, they said ten words his impatience overflowed; he jabbed and wounded and the blood flowed." Bagnold has left an interesting account of what it was like to be sculptured by Gaudier-Brzeska: "I went to his room in Chelsea - a large, bare room at the top of a house - it was winter, and the daylight would not last long. While I sat still, idle and uncomfortable on a wooden chair, Gaudier's thin body faced me, standing in his overall behind the lump of clay, at which he worked with feverish haste. We talked a little, and then fell silent; from time to time, but not very often, his black eyes shot over my face and neck, while his hands flew round the clay. After a time his nose began to bleed, but he made no attempt to stop it; he appeared insensible to it, and the blood fell on to his overall." Over the next couple of years he associated with leading literary and artistic figures such as Edward Marsh, Roger Fry, Wyndham Lewis and Ezra Pound. 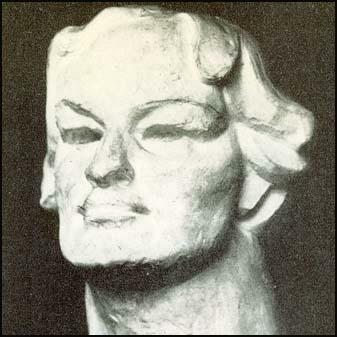 Gaudier-Brzeska became a founder member of the London Group and the following year signed the Vorticist Manifesto in 1914. Evelyn Silber has argued: "Through his friendship with Pound, Gaudier-Brzeska became increasingly identified with the nascent vorticist group during 1914. His sculptures... take on increasingly sharp-edged, geometric, and abstract forms in keeping with the vorticists' virile, machine age aesthetic." On the outbreak of the First World War, Gaudier enlisted in the French Army. On 1st October, 1914, he wrote to Edward Marsh: "I have been at the Front for the last fortnight and have seen both latent and active fighting. By latent I mean staying days in trenches under heavy artillery fire, keeping ready for any eventuality such as a raid or an unforeseen forward movement from the enemy - by active, a nice little night attack that we made last Saturday night upon an entrenched position. We crept through a wood as dark as pitch, fixed bayonets and pushed some 500 yards amid fields until we came to a wood. There we opened fire and in a bound we were along the bank of the road where the Prussians stood. We shot at each other some quarter of an hour at a distance of 12-15 yards and the work was deadly. I brought down two great giants who stood against a burning heap of straw - my corporal accounted for four more, and so on all along the line. They had so much luck, unhappily, for out of 12 of my squad that went we found ourselves five after the engagement." After two promotions for bravery, Sergeant Henri Gaudier-Brzeska was killed at Neuville St. Vaast on 5th June, 1915. Although his work was ignored during his life-time, Gaudier was afterwards widely recognized as one of the most important sculptors of his generation. Claud Lovat Fraser was the first to be excited by Gaudier's extraordinary talent. But soon he drew away from him. Lovat, most indulgent of men, would never express dislike, but he would not waste time on Gaudier's burning, voluble, cascading talk, though he deeply respected his art. I didn't like him either; and Gaudier on his side found us both middleclass. We had no idea then of his crippling poverty. He had no time for talk because he was out of work. Too proud to say so he talked instead of eating. He didn't want to know what people were like. He rushed at them, held them, poured his thoughts over them, and when in response, they said ten words his impatience overflowed; he jabbed and wounded and the blood flowed. I went to his room in Chelsea - a large, bare room at the top of a house - it was winter, and the daylight would not last long. While I sat still, idle and uncomfortable on a wooden chair, Gaudier's thin body faced me, standing in his overall behind the lump of clay, at which he worked with feverish haste. We talked a little, and then fell silent; from time to time, but not very often, his black eyes shot over my face and neck, while his hands flew round the clay. After a time his nose began to bleed, but he made no attempt to stop it; he appeared insensible to it, and the blood fell on to his overall. At last, unable to stand it any longer, I said: "Your nose is bleeding". He replied: "I know, you'll find something to stop it in that bag on the wall"; and all the time he went on working, while the light got less and less. The bag was full of clothes belonging to Gaudier and Miss Brzeska, most of them dirty, most of them torn. I chose something, long-legged drawers, I think, and tied them round his nose and mouth and behind his neck. "Lower!" he said impatiently, wrenching at it, unable to see properly. I went to my seat, but after a time the cloth became soaked through with blood. The light had gone, and in the street outside there was a terrific noise. It was a dog-fight, one large dog pinning another by the throat, and Gaudier left his work to come and watch it. He watched it to the finish with dark, interested eyes, his head against the window, and the street-lamp shining on his bloody bandages. I have been at the Front for the last fortnight and have seen both latent and active fighting. By latent I mean staying days in trenches under heavy artillery fire, keeping ready for any eventuality such as a raid or an unforeseen forward movement from the enemy - by active, a nice little night attack that we made last Saturday night upon an entrenched position. We crept through a wood as dark as pitch, fixed bayonets and pushed some 500 yards amid fields until we came to a wood. There we opened fire and in a bound we were along the bank of the road where the Prussians stood. We shot at each other some quarter of an hour at a distance of 12-15 yards and the work was deadly. I brought down two great giants who stood against a burning heap of straw - my corporal accounted for four more, and so on all along the line. They had so much luck, unhappily, for out of 12 of my squad that went we found ourselves five after the engagement. My lieutenant sent me out to repair some barbed wire between our trenches and the enemy's. I went through the mist with two chaps. I was lying on my back under the obstacle when pop, out came the moon, then the Boches saw me and well! pan pan pan! Then they broke the entanglement over my head, which fell on me and trapped me. I took my butcher's knife and hacked at it a dozen times. My companions had got back to the trench and said I was dead, so the lieutenant, in order to avenge me, ordered a volley of fire, the Boches did the same and the artillery joined in, with me bang in the middle. I got back to the trench, crawling on my stomach, with my roll of barbed wire and my rifle.